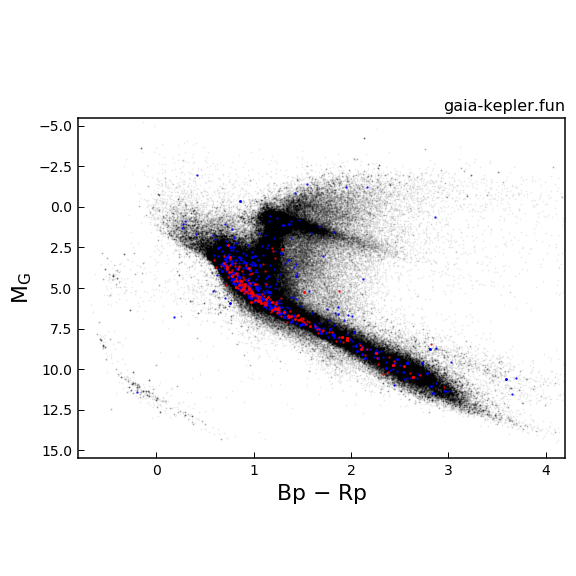 This website provides cross-matched catalogs of Gaia data for stars observed by Kepler/K2. Kepler targets currently have Gaia astrometric solutions as of DR2. K2 targets currently have Gaia astrometric solutions as of DR2. Scroll down to download the data as binary FITS tables ready to be read by Astropy. Website made by Megan Bedell (Flatiron Institute). UPDATE 29-04-18: Kepler and K2 solutions now include distance estimates from Bailer-Jones et al. ; also, the calculated angular distance between Kepler and Gaia source locations takes into account the different reference epochs. UPDATE 03-06-18: Some small bugs causing duplication of rows are fixed, and a full explanation of how these cross-matches were done has been added to the github repo. UPDATE 09-04-19: Fixed bug that caused Gaia sources without measured parallaxes to be dropped and alightly wrongified the calculated angular separations for stars with negative reported parallax. Here's a color-magnitude diagram for all KIC objects with Gaia G < 18 and parallax > 0.1 milliarcseconds. Fainter stars may have less reliable parallaxes. Stars with candidate planets are blue, stars with confirmed planets are red, and all stars with no known planets are black. This is a cross-match with the NASA Exoplanet Archive q1_q17_dr25_stellar catalog consisting of all stellar targets with long-cadence observations from Kepler; see here for detailed descriptions of the KIC data columns. 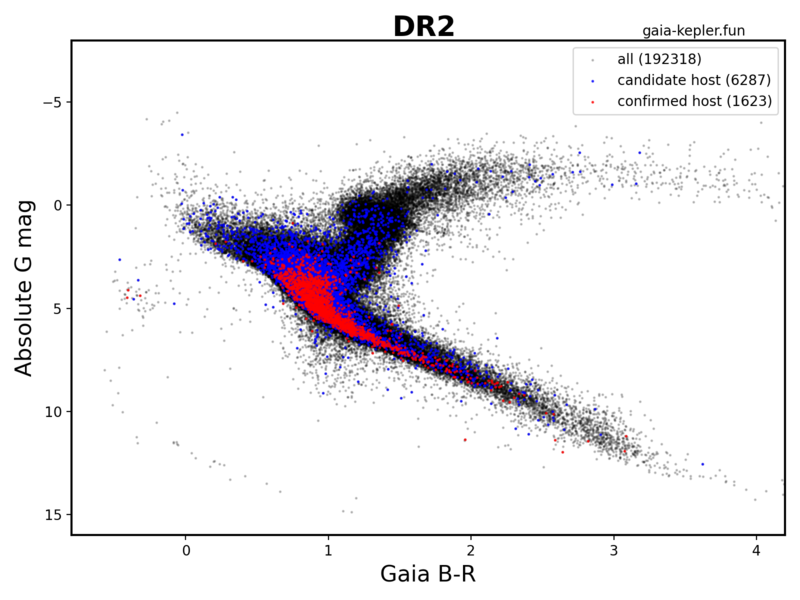 For descriptions of the Gaia columns see here, and for details about the distance columns (which begin with "r_") see this preprint. Here's a color-magnitude diagram for EPIC objects with Gaia G < 18 and parallax > 0.1 milliarcseconds. Fainter stars may have less reliable parallaxes. Stars with candidate planets are blue, stars with confirmed planets are red, and all stars with no known planets are black. This is a cross-match with the NASA Exoplanet Archive k2targets catalog consisting of stellar targets from the K2 EPIC; see here for detailed descriptions of the EPIC data columns. For descriptions of the Gaia columns see here, and for details about the distance columns (which begin with "r_") see this preprint. First download whichever data set you wish by clicking on the appropriate FITS file above and downloading from Dropbox. Depending on your use case, you may wish to download the query results using a 4 or 20 arcsecond search radius around the Kepler/K2 coordinates (to ensure that multiple sources falling within the same Kepler pixel or multi-pixel aperture are included) or using a 1 arcsecond search radius (to limit matches to the most likely Gaia counterpart to the Kepler/K2 catalog source). You can also export the table in a variety of alternative formats with the data.write() function or convert it to a pandas dataframe as data.to_pandas(). You can find a Jupyter notebook that I've been playing with (and using to make some plots on this website) here. If you want more information about how I made these tables, you can get the full cross-match instructions here. This is an open-source project, so please feel free to fork & update on github! The data provided on this website come from the European Space Agency (ESA) mission Gaia, processed by the Gaia Data Processing and Analysis Consortium (DPAC). Funding for the DPAC has been provided by national institutions, in particular the institutions participating in the Gaia Multilateral Agreement. Data on this website also come from the Kepler and K2 missions, funding for which is provided by the NASA Science Mission directorate. Access to these catalogs was provided by the NASA Exoplanet Archive, which is operated by the California Institute of Technology, under contract with the National Aeronautics and Space Administration under the Exoplanet Exploration Program. We use the cross-match service and Vizier catalogue access tool provided by CDS, Strasbourg, France. We also use the astroquery and astropy python packages. Feel free to use these data as you wish, but please be sure to cite the relevant Gaia and/or Kepler sources in any resulting publications, as well as Bailer-Jones et al. (if you use the distances). Should you wish to acknowledge this website, here is a suggested wording: "This work made use of the gaia-kepler.fun crossmatch database created by Megan Bedell." Questions? Complaints? Compliments? Email or tweet me! Thanks for reading this. Here, have a puppy.